U.S. Department of Treasury headquarters in Washington DC. 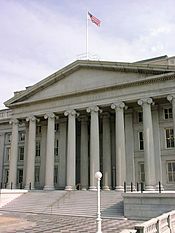 The United States Department of the Treasury is a Cabinet department and the treasury of the United States government. It was established by an Act of Congress in 1789 to manage government revenue. The first Secretary of the Treasury was Alexander Hamilton. He almost single-handedly worked out the nation's early financial system, and for several years was a major presence in Washington's administration as well. His statue still stands outside the Treasury building. United States Department of the Treasury Facts for Kids. Kiddle Encyclopedia.